As part of a TFL strategy to promote cycling, we were commissioned to develop a cycle strategy for the Docklands Light Railway network. We produced a completely new and award-winning modular design for intricately detailed and solar-powered cycle shelters with battery storage for night lighting of the shelters. Here it is shown with a mains-powered public space lighting option to the front, and a bus-shelter option to the rear. We rolled out the system across other stations in the DLR network. 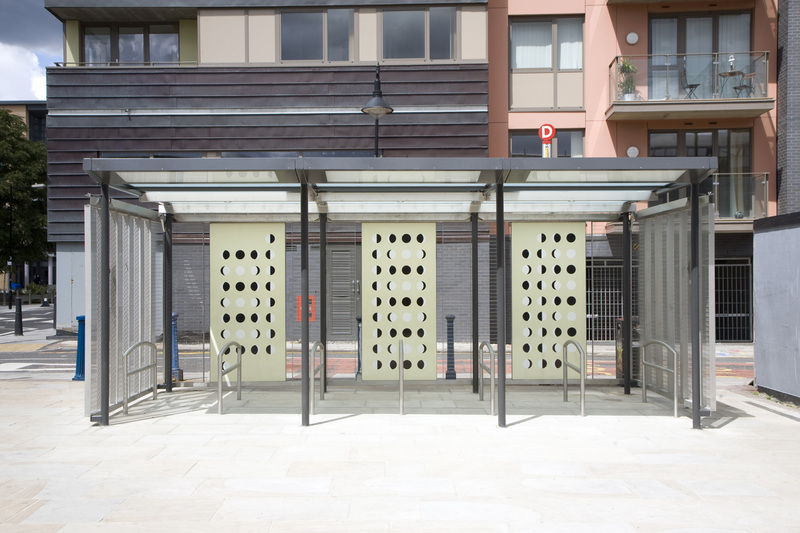 This two-year project involved collaborating with artists in the provision of station-specific wall-panel designs.